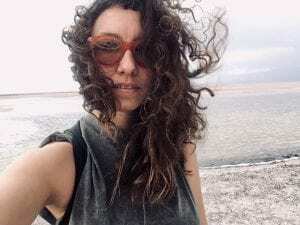 Professor Thea Riofrancos is spending her spring semester on the Salt Flats of the Atacama Desert region of northern Chile. While there she is conducting fieldwork on lithium extraction. Lithium, the world’s lightest metal, is used to make the batteries that not only power cell phones, but electric cars and grids that function with renewable solar or wind energy (which require battery storage), and is therefore important for the renewable energy transition. However, the process is itself energy and water intensive, thus impacting local ecosystems and communities in this arid region.